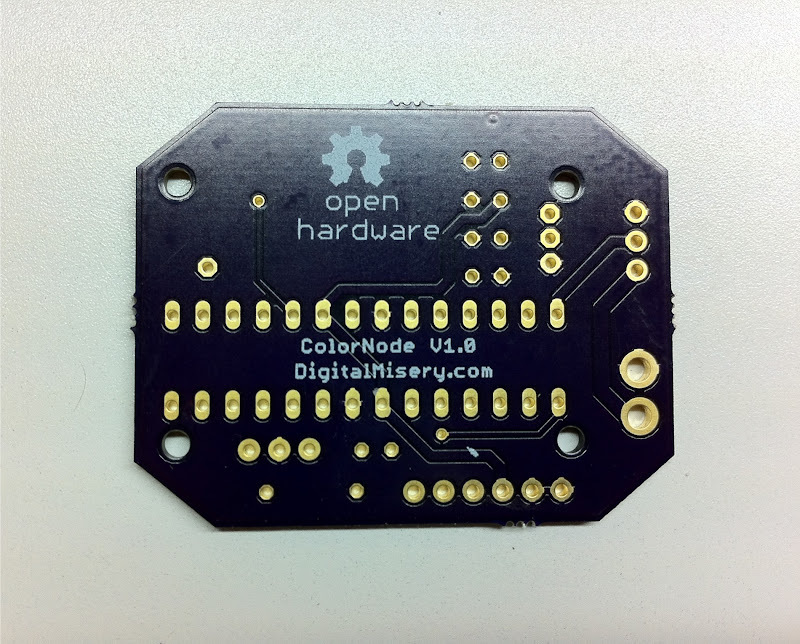 The original version of the ColorNode PCB only utilized a handful of pins since it only interfaced to the RFM12B and the LED string. I created the newer version (V1.1) to use a different set of capacitors, to add an LED which could be useful for debugging, and to break out additional pins (pads underneath the PDIP). 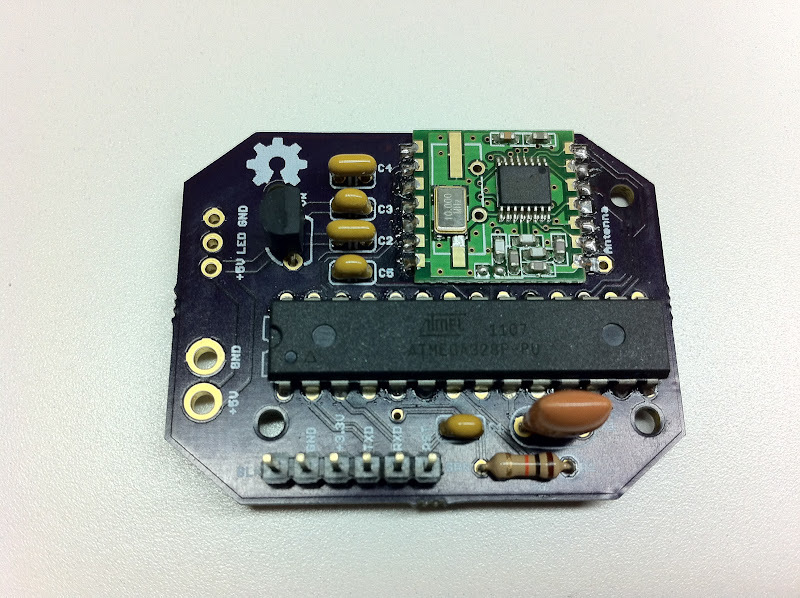 I also specifically broke out the I2C pins since I wanted to use this board for other misc things like my thermostat. The only pins not connected on V1.1 are PC0-PC2 (corresponding to A0-A2 on an Arduino board) and PD4 (D4). They do not connect to anything other than the solder holes. New connections: PD5, PD6, PD7, PB0, and PB1 (D5-D9) are on those pads under the chip. The spot for an LED is on PD3 (D3) and the GE ColorEffects string now connects to PC3 (A3/D17). 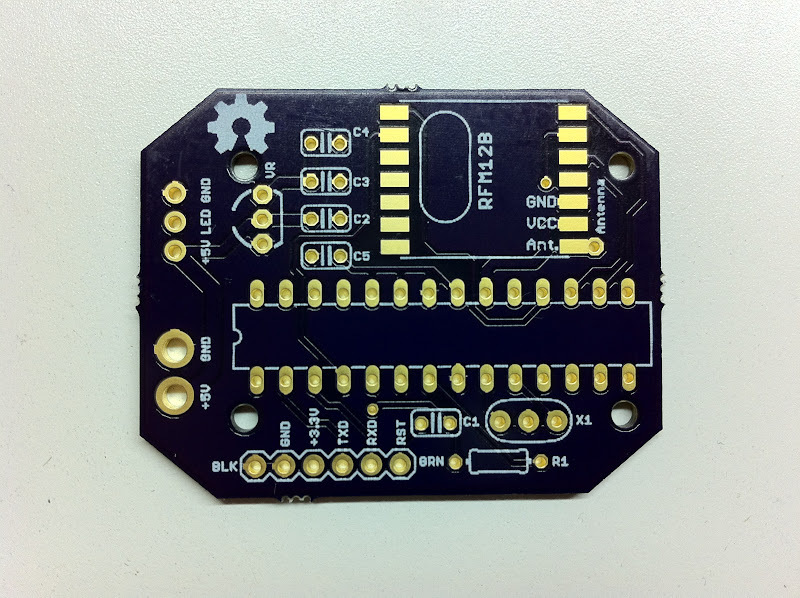 It was on PC5 (A5/D19) but I re-purposed that for the I2C pins. 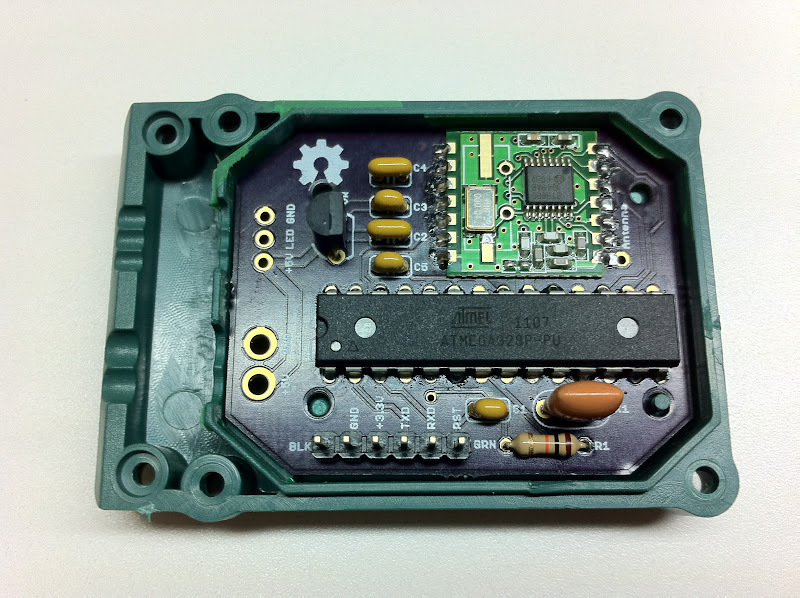 For standoffs, the holes through the PCB are sized for the GE box but you might be able to squeeze a #2 or M2 screw through them. I’ve used double-sided foam tape in the past when I want to mount the board somewhere in a box. It’s not the prettiest or the most secure but it gets the job done. Your v1.1 PCB sounds like what I want. I downloaded the v1.1 zip link on this page above. I tried loading it into Eagle (first time using PCB design software) and am confused. I can see the changes to the capacitors and the added LED, but I don’t see any extra pads for other pins under the chip you describe. It also looks like the same pin is used for the data line to the GECE string. Am I missing something in Eagle (highly likely as I’ve only been using it for about 30 minutes) or are you describing additional changes you made after v1.1? No it is my mistake – I had done some changes to the PCB and uploaded that .zip file and then I made additional changes but forgot to add them. I’ve got the new design files and software examples up on the ColorNode GitHub repository: http://github.com/digitalmisery/ColorNode Sorry about the confusion. Thanks, I found the version you are talking about. Looks exactly like what I want. Having the extra pads in the PCB will work better than soldering on wires here and there to the atmega chip. Do you happen to have a BOM for v1.1? If not, I’m really just curious about C3. I want to make the holes for connecting the LED strings the same size as the larger holes for +5 and GND. I thought it would be an easy thing to make them bigger and spaced a little farther apart. This does not seem to be the case. How can I do this? I’m planning to make a 14-string mega tree with all the controls in a single large box with ~5 ft of 16ga wires running to each light string. I considered switching to something like SanDevices E682, but decided to give it a shot with a bunch of color nodes. Last year my biggest point of failure was water leakage inside the 5v transformers. Two of them failed. For this project I’ll use a single 350W power supply in a well sealed box. It was fun last year explaining to a couple of folks who were interested in having a similar light setup on their house how it all worked. They were a little disappointed they couldn’t just buy the light strings from the store and have them all synced up. Getting ready to put up lights today. Just checking in to see if there are any 2013 program updates I should apply before hand. Is anyone selling these PCBs? About a year ago. you could find them on the internet. They only have the first revision.